1. Are Bleach based Shower Cleaners the best? 2. The more Shower Cleaner I use, the better? 3. I have a cat/a dog is it safe to use shower cleaners on a Daily Basis? 4. Can I Use Multipurpose Shower Cleaner on All Surfaces? 5. Should I Clean the Shower Before Using a Shower Cleaner? Are you tired of spending countless hours cleaning your bathroom? With the best shower cleaner in hand, this will be a thing of the past. Bathrooms are by far one of the most used spaces in most homes. At the very least each family member visits the bathroom twice in a day. For this reason, it is imperative that the bathroom and all accessories present are kept hygienic and clean at all times. But this is easier said than done. Cleaning the areas in the shower is a tasking chore – many dread it. But with the help of best rated shower cleaner, you will glide through this chore with ease. In this piece, we discuss and review some of the best options available. We sieve through the sea of shower cleaners and present you with only the best, and that are worth your time and money. Each time you step out of the shower, you leave behind soap scum and stains for hard water. When it is time to clean, you will have a hard time getting the surfaces sparkling again. A shower cleaner is a solution designed to get rid of residues with ease. In addition to this, most are designed to form a protective layer over the shower surface to prevent soiling. Shower cleaners come in plastic spray bottles. A few squirts of the shower cleaner is usually enough to clean your shower. Scented products leave behind a sweet and clean smell. How does this solvent work? First, it penetrates and loosens all the scum and greasy soils on your shower surfaces. Second, it breaks down the soap scum and dirt with the help of warm water. Depending on the brand, the solvent will disinfect your shower in a few seconds. 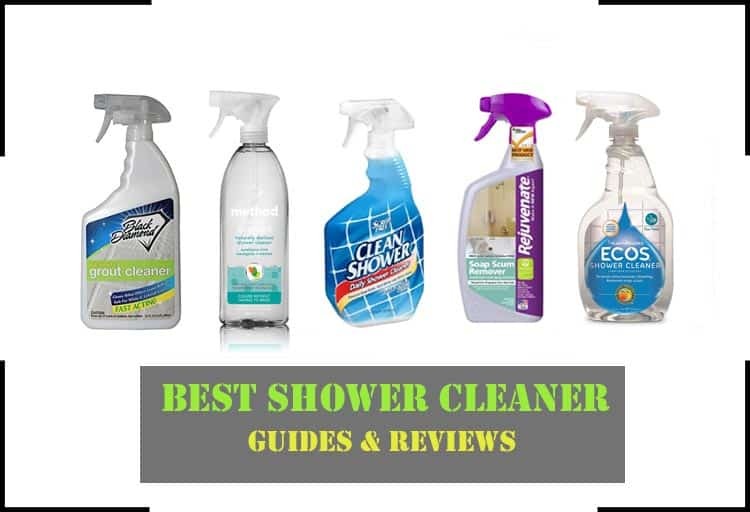 Below is a comprehensive guide to help you choose the best shower cleaner for your needs. The list contains a total of 10 products – the best in the industry. If you do not have time to read through the entire piece, below is a comparison chart to provide you with an overview of what to expect from each product. 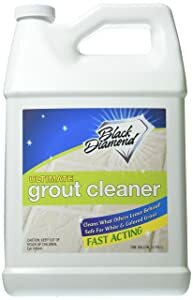 Black Diamond Ultimate Grout cleaner is one of the best shower cleaner available. It is designed to get rid of grime, oil, and grease effectively. Additionally, it works wonders in removing soapy deposits on stone surfaces and cleans up grout and tiles. I recommend this shower cleaner for several reasons. First, this grout and tile cleaner contains no acids. For this reason, this unit is safe to use on both colored and white grout. With it, you do not run the risk of having the surface colors fade with time. It preserves the beauty while getting rid of dirt and grime. Second, this shower cleaner is labeled ‘strong enough for commercial use.’ While most shower cleaners use such wording as a marketing gimmick, Black Diamond means it. Ultimate Grout Cleaner is a deep cleaner gets rid of dirt, grease, soap scum and food spills fast. It guarantees a sparkling clean grout and tiles. The solution keeps your bathroom hygienic and clean. In addition to getting rid of dirt and grime, it kills germs. The beauty of the Ultimate Grout Cleaner is that it is fast acting. Even when working on the dirtiest grout, cleaning will only take a few minutes. Minimal labor and pressure are required. Note: While it may be a great soap scum remover, bear in mind that it cannot remove water or calcium spots. Given its non-acidic nature, it also cannot work on mold and mildew. For a gentle yet powerful shower cleaner, Ultimate Grout Cleaner takes the prize. When using it, bear in mind of its shortcomings though. Its acid-free design makes it less effective on mold and mildew. I love it for a couple of reasons but mainly because it is created using non-toxic ingredients that break down grime and dirt naturally. The formula, a combination of corn-starch and lactic acid easily dissolve mildew. Additionally, this mixture prevents the buildup of lime deposits and soap scum. It leaves behind a fresh smell with the surfaces gleaming clean. Speaking of fresh smell, the formula contains a blend of citron, bergamot, eucalyptus, and mint. The shower smells like forest. In an industry full of cleaning products with boring and bland smells, Method prides itself in providing products that have great scents. It does not cause irritation. The shower cleaning formula is contained in 100% recyclable bottle. This actively helps in reducing plastic waste and keeping the environment clean. The solution is also biodegradable. 70% of all the organic ingredients break down in just 28 days. Crowning it all, Method does not experiment or perform tests on animals. 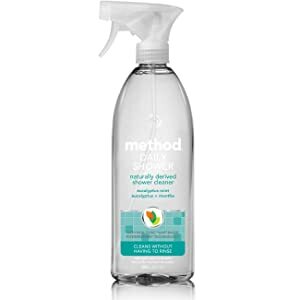 While using Method shower cleaner, you will need to use it daily. With its daily use, there isn’t need for a regular scrubbing. I found it to be perfect for use on non-porous surfaces including glass tubs, fixtures, tiles, and showers. For a medium-sized shower, say approximately 70x90 cm with three tiled walls, an 828 ml bottle lasts for about one month. For a naturally derived shower spray, this Method product is quite effective. If you are an avid follower of automatic shower cleaners, you surely have heard of scrubbing bubbles automatic. It is an SC Johnson shower cleaner. SC Johnson is a leading company in the industry. It is without a doubt one of the best shower cleaners available. This shower cleaner comes in a 34-ounce pack which is perfect for daily in-house use. Even better, I realized that this unit could be installed in pretty much any bathroom. The installation is quick and easy. The SC Johnson technology is efficient and effective. The best way I can describe this shower cleaner is as my ‘cleaning partner.’ The cleaning solution will get rid of soap stain, watermarks, dirt and scum following a relaxing hot water shower. After installation, all I had to do was press a button and let the cleaning happen automatically. When the cleaning is complete, it turns off automatically. This pack lasts for 30 days and is perfect for all shower types and surfaces. The unit features a 360-degree rotating mechanism and a dual sprayer. These allow for the unit to cover the four walls and the bathtub with ease. The spinning is quiet. When you purchase this unit, I recommend you engage the booster button for more power and cleaning efficiency. In this mode, the technology releases stronger sprays. From experience, the working of this automatic unit is effective and seamless. 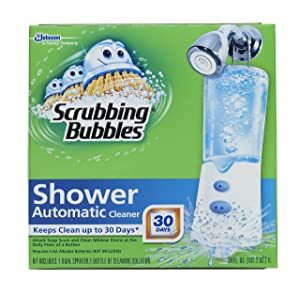 Soap scum, dirt, and odors are no match for Scrubbing Bubbles Automatic Shower Cleaner. It is a product of a popular brand – Arm & Hammer. 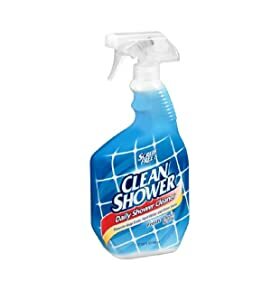 This shower cleaner comes in 32 fl. Oz bottles. I recommend its use as it matches the industry standard of purity. Unlike most shower cleaners, Clean Shower - shower cleaner gets rid of mildew stains and soap scum easily. It also prevents reattachment and buildup. All you need to do is spray and wait for it to work the magic. Yes, with this unit, no scrubbing is required. And the best part is that it is free of harmful chemical fumes. Instead, it features a clean and fresh scent. I used it on all my shower surfaces, and it worked great. The fact that it is bleach free makes this possible. To achieve best results with this unit, I realized I had to clean the shower surfaces first. The surfaces need to be wet and warm for best results. Once the cleaner is sprayed, you allow for a few minutes and later wipe and rinse. After cleaning your shower with this cleaner, ensure you run the tub water or shower for a few minutes before entering to a bath or shower. Or at the very least, you should get a non-slip surface. The cleaner doesn’t leave a residue when used as directed on the labeling. It is 32 fl. Oz. With so many shower cleaners in the market, it is shocking to note that few live up to the hype. This shower cleaner, however, is effective and leaves a clean and fresh scent. The moment you realize you have a mold problem in the house, you should take immediate action. Any delay leads to an increased cost of repair. While air filters are excellent in improving air quality, ultimately, you need a product that will reduce the level of contamination. Here is where the Home Armor mold Stain Remover comes to the rescue. I have found this to be a powerful weapon against mold. Any surface in the house with mold and mildew patches are quickly gotten rid of by Home Armor. Simply put, home armor is the best shower cleaner for mold and mildew. It grabs the ‘best’ title courtesy of its ease of use and super powerful nature. It is said to be twice as powerful as the leading bleach-based formula designed to clean out mildew and mold stains. In addition to getting rid of mold and mildew, it is created to mask the mold odor and leave the surfaces extra shiny. Once the mold is cleaned out, the formula protects the surface from mold and mildew for about two months. Very fast acting and easy to use. To clean, it does not require scrubbing. It is perfect for tiles, grout, tubs, fiberglass, vinyl curtains, sinks, and counters. 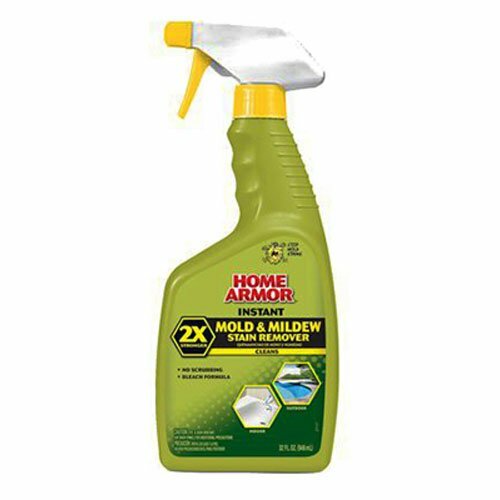 The Home Armor Mildew Remover is genuinely an ideal cleaner for those surfaces in your home prone to mildew and mold growth. It is powerful and easy to use. It kills with immediate effect and dissolves mildew and mold stains. All you need to do after is wipe the mess away. Wet & Forget Shower Cleaner is one of my favorite shower cleaner yet. 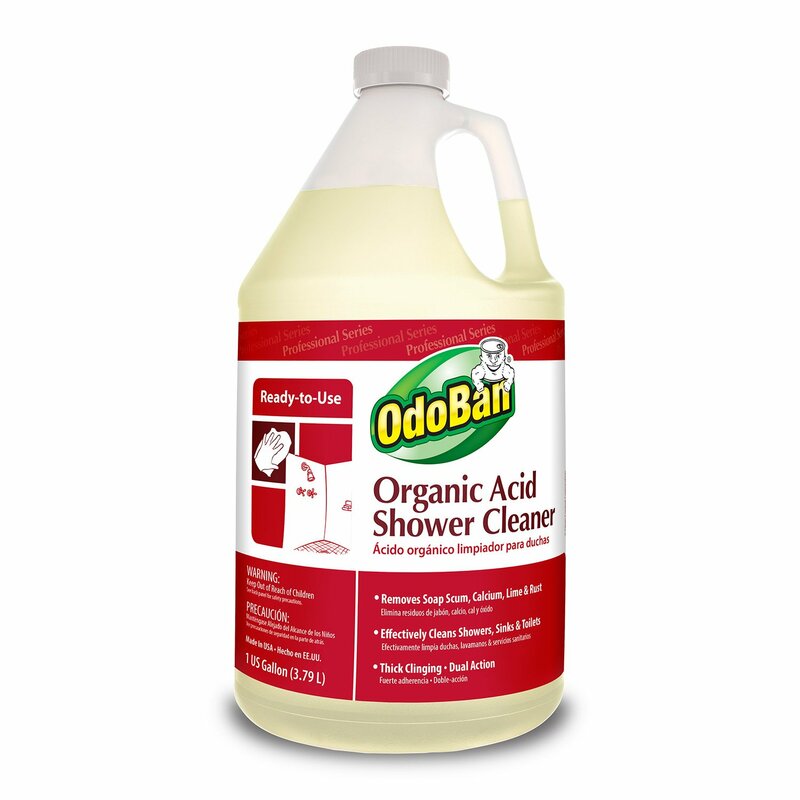 This product though designed with soft chemistry gets rid of hard work in cleaning your showers. Using this product, you will not need to scrub or even wipe. Simple spraying on the surfaces and fixtures after a shower, leaving it overnight to work its magic and rinsing the following day will work. The fact that it is designed using soft chemistry means that you will not have to deal with harsh and irritating fumes. It is free of dyes, ammonia, and bleaches. The unit features a remote trigger sprayer which is designed to make work easier. Every squeeze of the sprayer releases about 65% more cleaning solution than any other sprayer mechanism. It ensures that you will get out of the bathroom faster than other sprayers. The sprayer allows you to spray upside down and reach some of the hard to reach areas. 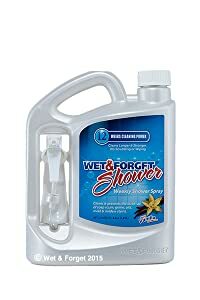 Dual surfactants power Wet & Forget Shower. One of the surfactants works to loosen and also dissolve soap scum while the second works on the body oils. This product works immediately it comes in contact with the surface and ensures the shower remains clean for a whole week. Shopping for this product is easy as well. The unit provides a whopping 64 ounces which last for about 12 weeks. For other shower cleaners, you would have to purchase about 8 32 ounce bottles to get the same amount of surfaces cleaned. It is economical and affordable. It is a one of a kind shower cleaner which has everything a winning product should have. While it can work on a host of fixtures and surfaces, always test on a small area when working on hard water and dark tiles. Doing this helps to prevent highlighting calcium deposits. It is state of the art and ready to use bathroom cleaner. This shower cleaner has a perfect combination of cleaning and thickening agents for a vertical surface hold. It means that the liquid will not cascade down a vertical surface upon application and not have enough time to work. The thickness reduces its ability to flow and sticks to the surface. This shower cleaner works to remove hard water stains, lime, rust, calcium and soap scum on the bathroom surfaces and fixtures. The beauty of this cleaner is that the surfactants are biodegradable. It is environmentally friendly and a perfect alternative to caustics, mineral acids and other harsh and abrasive chemicals. The shower cleaner comes in a 1-gallon bottle. When using the shower cleaner, it is important to remember not to breathe the mists. When you are not using the product, keep the bottle closed. Also noteworthy, never mix it with bleach or bleach products. Also worth noting is not to use the cleaner on marble, unglazed tiles or other forms of natural stones. You can use the shower cleaner on shower stalls, sinks, tubs, glazed porcelain and tiles, grout, fiberglass, metal and stainless steel. 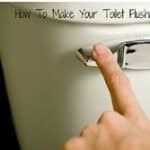 The thick formula will cling to urinals and toilet bowls as well. It is efficient on these surfaces and fixtures. It is may not be the most popular brand on the market, but its products are efficient and do get the job done. Bucko Soap Scum Remover comes highly recommended by its users for a couple of reasons. 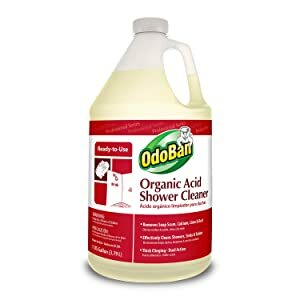 It by far the best shower soap scum cleaner available. First and foremost, it has impressive commercial strength. As a result, the solution dissolves even the most hardened grime and soap scum on surfaces. It leaves behind nothing but a beautiful and shiny surface. The shower cleaner is also useful on dull chrome fixtures, sinks with dried detergent buildup, acrylic bathtubs, and wheel rims. I recommend this product for its pleasant lemon water smell. The cleaner features no acid, bleach or harsh chemicals. It is non-toxic and is safe to drain into septic tanks. You can use it on tough projects or minor touchups. Whichever the case, the results will be through the roof. The efficiency of this shower cleaner allows for simple spraying and wiping down. For some tougher stains, however, you might have to let the solution sit for a while and work its magic before wiping it down and rinsing the surface. 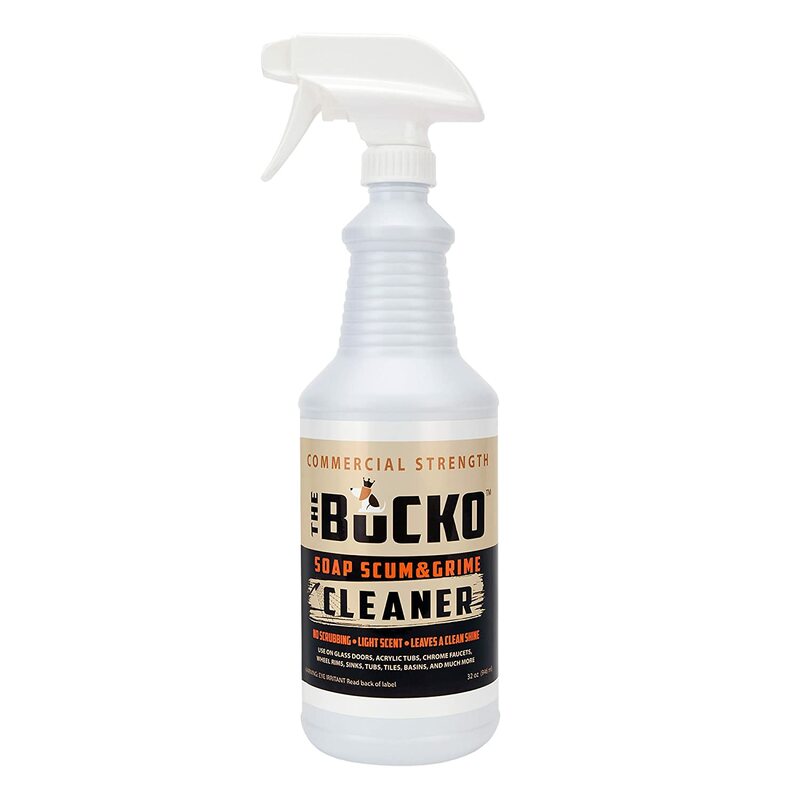 For a clean and shiny look, the Bucko Soap Scum is the best shower cleaner. Its strength and pleasant smell make it a preferred choice by many. It is the winner of several cleaning product awards. What more can one ask? Many love it for its prowess and achievements in the industry. The awards testify to its effectiveness and functionality. The Rejuvenate Scrub Free Soap Scum Remover features on this list for several reasons. First, this product contains a non-toxic and non-abrasive formula. It is easy to use. Simply spray and rinse off any gunk built up on the surface and you are good to go. It is packaged in a 24-ounce bottle and works on plastic surfaces as well. In addition to being non-toxic, this shower cleaner is free of fragrance. This way, asthmatic persons do not get their allergies excited by the scent. This does not mean that it does not leave a fresh scent. It does. Getting rid of gunk and dirt achieves this automatically. Rejuvenate is safe to use on ceramic tile, glass, natural stone, plastic, porcelain, and chrome. Yes, even natural stone. With this, rejuvenate has achieved a milestone most brands have failed. It is easy to use as you do not have to tire yourself scrubbing away the gunk. The solution powers through the layers and dislodges them from the surface. You only need to rinse the solution off, and it comes off with the dirt. When compared to products in its price range, Rejuvenate is a real performer. 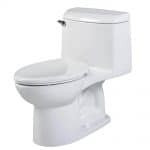 It gets the job done fast and leaves behind a very light odor which disappears almost immediately. Ecos made a promise to ensure green cleaning is a reality all get to experience. They are determined to make this possible by using sustainable practices that help to protect the planet and its inhabitants. Ecos formulates products from plants. Renewable energy runs their facilities. It enables the company to provide these environmental friendly solutions at affordable rates. The Eco-friendly products were created by John E. Vlahakis back in 1993. The company has since kept its promise to ensure green cleaning is a reality. With this product, it is like you have superpowers. Cleaning is a breeze. Now, this particular Earth Friendly Shower Cleaner has been designed to be powerful containing soothing tea tree oil. This ingredient helps to keep your surfaces clean and fresh. 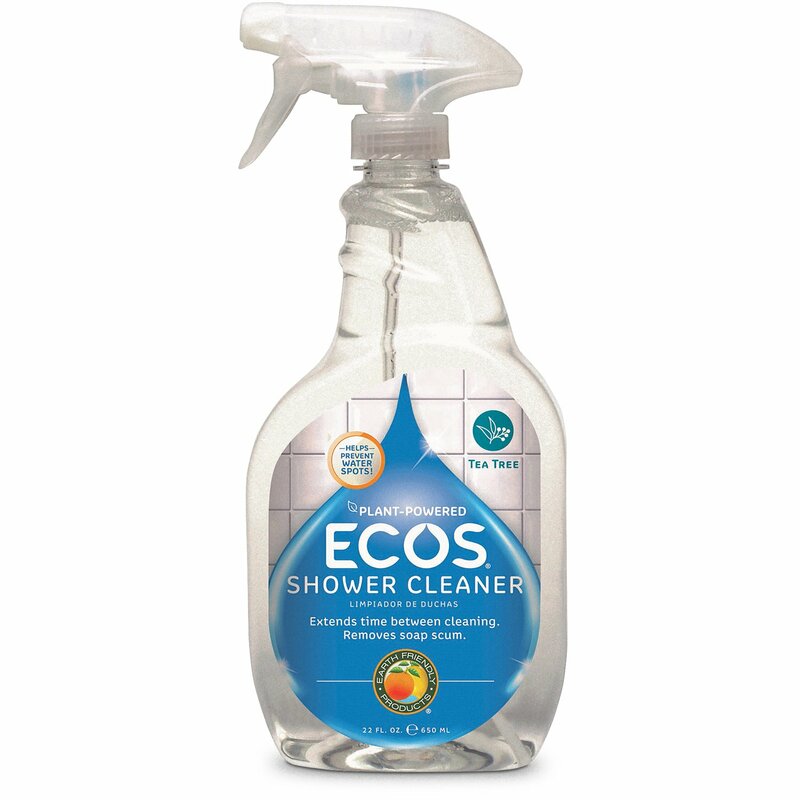 Ecos gets rid of soap scum, smudges, and stains with a fast and straightforward 'spray-and-wipe' process. A little spray of this unique product will prevent the build-up of yucky gunk on your shower surfaces. It helps to extend the time in between cleaning as it offers some protection. So not only reduces cleaning time but postpones it for longer. This sower cleaner is perfect for use on shower surfaces and cleaners. It perfect for daily protection from fingerprint residue, water spots, and buildup of soap scum. It protects the surfaces. 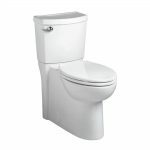 Bathrooms have all kinds of different accessories, surfaces, and products that require maintenance. Shower cleaners are the perfect tool for the job. 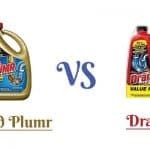 Now that we have looked at some of the best shower cleaners on the market, below are some considerations you ought to make to land the best cleaner outside of this list. It is imperative that you consider the surface you will be cleaning. Glass and tiles all need different shower cleaner types. While most cleaners are multipurpose, there are some that leave a shine on surfaces. In other cases, the surface gets dull or even discolored. This, however, is all about personal preference. But generally, some of the best shower cleaners have a soft and fresh scent. The scent does not irritate kids or elderly persons in the family. Cleaners with a strong scent are not best for daily use. The fewer the fumes, the better. Most bathroom products are never hard to use. It is because they come with instructions and directions for use on their labeling. A single read is enough to make you a pro at the cleaner. Cleaners that come in sprayers make it easy for individuals to apply on surfaces. If you are a stickler for preserving the environment, you should pick an environmentally friendly product. These are derived from plants and do not harm the environment. The ingredients and agents used are natural and biodegradable. Different surface types require different components and power to get clean. A solution with water and Vinegar in the ratio 1:1 is perfect for getting rid of soap scum. On the other hand, cleaners with a lot of baking soda are perfect for getting rid of light or mild stains from shower surfaces. Powerful shower cleaners feature strong vinegar which is effective on tough stains. Shower cleaners are readily available on the market. They are available in different brands, price ranges, types, and volume. With such variety, you are bound to pick one that fits in your budget. Well, the term ‘best’ is relative. Ideally, the best product depends on what you want the shower cleaner to be able to do. While there are numerous bleach based shower cleaners available, they are not the only great products. There are specific stains that bleach removes excellently and others that it will cause to set and be harder to remove. When working with mold for instance, while bleach-based cleaner will provide a clean and shiny surface, the mildew will still be lodged in the porous surfaces. Actually, this could not be more wrong. In some instances, less is more. In this case, rather than flooding your shower surfaces with the cleaning solution, be keen to follow the manufacturer directions. The directions on the labeling will direct you as to just how much of the product you need to use. This will help you save time, money and prevent potential damages. Yes, it is safe. However, you need to use your shower cleaner as recommended and directed. This way it will not pose any health hazard to any of your household pets. Always read the precautionary instructions just like you do with other house cleaners. Always remember to keep your shower cleaner out of your pets' and Kids’ reach. Being a multipurpose cleaner, it means you can use it on all surfaces and fixtures. But be it as it may, there are some limitations to this use. 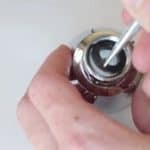 For instance, unless stated otherwise, with most shower cleaners, you are directed not to use on brass, marble or natural stone or other cracked or damaged surfaces. It is in your best interest that you start with as minimal dirt and grime as possible. This way, any soap scum, and dirt will not have a chance to build up. Starting with soiled surfaces will mean that the shower cleaner will have to be left for a longer time to achieve great results. Finding a suitable cleaning product for your shower surfaces and fixtures can prove to be a difficult process. This is especially if the shower and the walls are overgrown with mildew and mold. Our manually handpicked best shower cleaner will help you get rid of all the stains other cleaning products cannot. Additionally, it will ensure that the mold will keep the mold and mildew from reappearing. To keep your bathroom clean, you only need one great cleaning product. Luckily, the market is full of multipurpose shower cleaners. These will help you save cash in the process. I am confident that the information in this buying guide will have you enjoy a cleaner bathroom. You will spend less time cleaning as well.